The Navigation Tabs allow you to view the Contentsin MPMM, check out the Indexof all of the pages included in the tool and Findnew content based on specific search criteria. The Display Tabs link you to Life Cycleactivities and documents. They also allow you to access the Roadmap, Tutorialand Helpcontent. The Feature Buttons allow you to printcontent pages, to access your MPMM Settingsand view the MPMM Glossaryof terms. 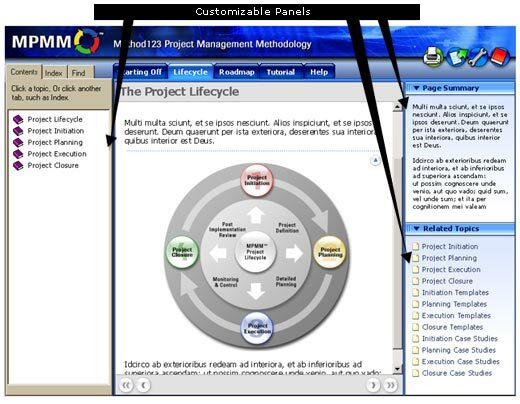 The Navigation Panelcontains a hierarchy of information, allowing you to navigate directly to any activity within the MPMM Project Life Cycle. You can access every page in this product by drilling up and down through the content hierarchy in this panel. 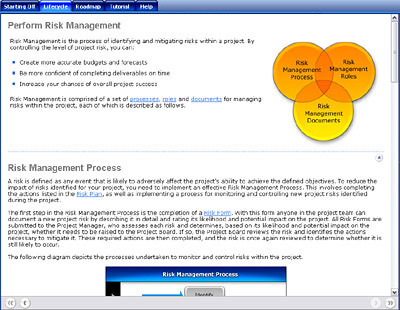 The Display Panel presents the content pages requested by the user. Whenever you select topics from the NavigationPanel, Related TopicsPanel or any other links within the tool, the content you have requested will appear here. On each page you will notice a series of text links. You can select these links to navigate directly to other pages in MPMM. You can also click on many of the diagramsin MPMM to navigate to the respective content sections of each page. By clicking on any of the short-cut arrowsfound on the right hand side of the content displayed, you will immediately scroll up to the start of the page. The Page Summary Panelsummarizes the content currently displayed in the Display Panel. It helps you grasp the content quickly without having to read the entire text. 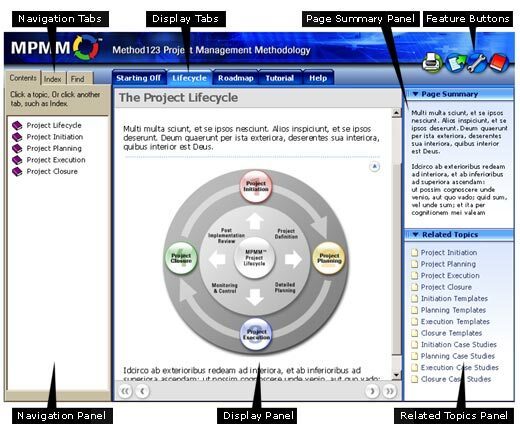 By reading a summary of each page, you will quickly get your bearings on each phase and activity included in the MPMM Project Life Cycle. MPMM Navigation Tabs give you three easy ways to find the content you need. The Contentstab enables you to navigate the complete hierarchy of information included within MPMM. The Indextab takes you to view an alphabetical listing of all of the content pages. The Findtab allows you to search for relevant content pages based on the search string you enter.